Healthy snacks for a Keto lifestyle? When you are new to the idea of clean eating, snacks can seem like a thing of the past, yet you still long for something salty, with an air of crispiness and a hint of spice. 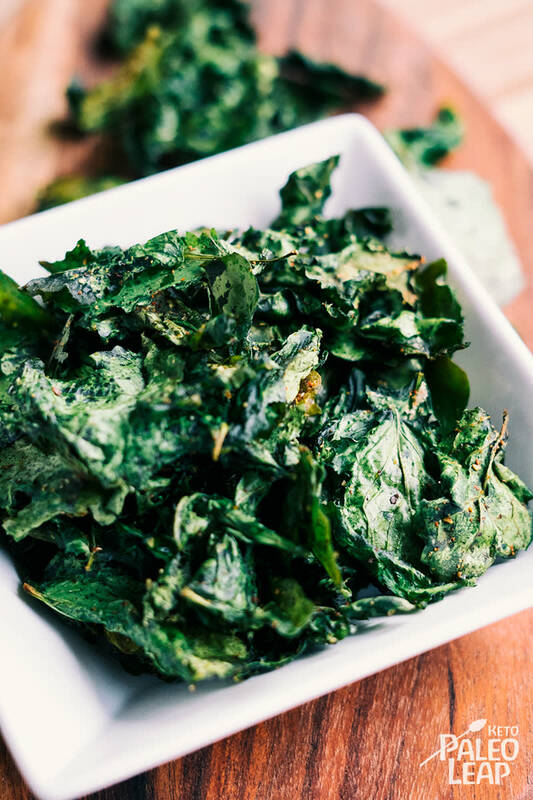 No, not a potato chip, those will not pass the test, but kale, that may work… and you may even discover your hidden love for nutritious leafy greens! If your kale is in need of rinsing, make sure to dry it completely with the use of a salad spinner and a paper towel for the crunchiest of results – any moisture left on the leaves will make for soggy, or less than desirable chips. Just as you don’t crowd the mushrooms, don’t crowd the kale either! Leave a bit of space, the chips will shrink a little, but you will want plenty of circulation to dry them out completely. If you have a smaller oven, bake two batches instead to avoid disappointment. As for cooking time, you will have to watch this closely. It depends on the thickness of the leaves, as well as your altitude. When the kale leaves are just turning brown and are hard to the touch, they are ready to remove from the oven. If you over bake them, they will start to wilt once again. If you set these out with a tray of appetizers, know that they will move quickly. You may want to set out some cauliflower hummus with crudités alongside them, for choices and texture sensations to be made. In a bowl combine the spices: paprika, chili powder, onion powder, garlic powder, and salt to taste. Cut the stems off of the kale leaves and cut the leaves to obtain “chips” of similar size. Place the kale in a bowl and toss with melted coconut oil and lemon juice. Sprinkle the paprika mixture over the kale and toss again until everything is well coated. Place the kale in a single layer on a baking sheet and place in the oven. Bake 25 to 30 minutes, turning after 10 to 12 minutes of cooking. Serve once the kale is crispy.